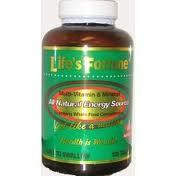 Life's Fortune Multi-Vitamin & Mineral All Natural Energy Source Supplying Whole Food Concentrates. There is one thing that everyone wants when they take supplements, INCREASED ENERGY! Within 28 minutes of taking Life's Fortune, your body begins to feel the power of this synergistic blend of vitamins and whole food concentrates. NNFA (National Nutritional Food Association) TRULABEL Registration & Lab Tablet Testing assures you of purity and high quality. Life's Fortune disintegrates within 28 minutes for better absorption. Life's Fortune Vitamins is an all natural food supplement that contains a combination and balance of organic and natural vitamins, minerals, antioxidants and enzymes in an exclusive whole food base. The potency of each vitamin and mineral in Life's Fortune was selected in such a way that nutrition in balance would occur in the proper ratio and harmony. This process causes the body to quickly and easily assimilate them. These balanced nutrients supply the fuel that sparks the electric vibrations the body need to function at peak mental and physical efficiency. Many people report a feeling of general well being when they take their daily multivitamins regularly. The individual vitamins and nutrients in a quality daily multivitamin delivers to you their specific benefits of each individual vitamin, plus you get the combined, synergistic benefits and effects of all of the ingredients working together. 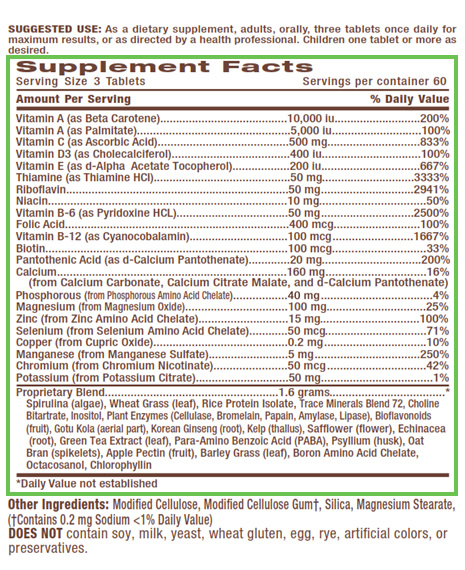 To scientists, researchers, and health conscious people, the benefits from supplements has never been in doubt. Most of us fail to eat a varied and well-balanced diet on a regular basis, and many people may require more of certain nutrients than their diets can provide. Young children, teenagers, pregnant women, those on vegetarian, vegan diets or poorly designed weight reduction diets, and chronically ill and elderly people. There are also some nutrients that may be difficult to get in food in adequate amounts and may need to be taken as a supplement by certain people. Plus we cook our food and that can kill certain nutrients, and the time from farm to table is often weeks, and much of the nutritional value is lost. Plants get their minerals from the soil, and it is so depleted that it is all but devoid of essential minerals such as selenium and zinc. Process foods are so lacking in nutrition, and make up so much of the American diet. Taking a good quality multi-vitamin & Mineral supplement like Nature's Plus Adult's Chewable Multi-Vitamin & Mineral, can really bridge the gap in nutritional deficiencies.